There is one candy in particular that is very popular during the Halloween season. Can you guess which candy it is that I’m talking about? Candy Corn, of course. 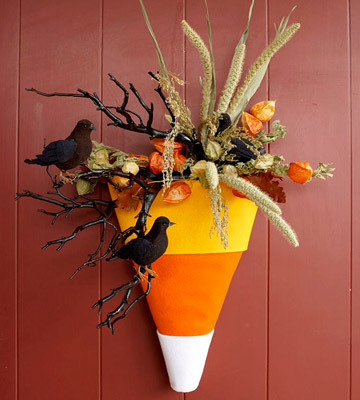 Better Homes and Gardens shows you how to make this adorable Candy Corn Door Decoration. It is very festive!! Isn’t this wreath dark and scary? It is perfect for Halloween. I found this Door Decorating craft over at Martha Stewart and I thought it was really beautiful…. in a dark, morbid way. 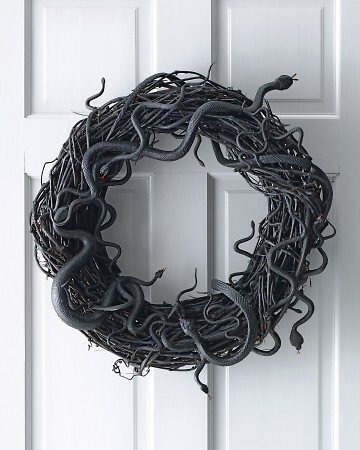 I love the snakes that are wriggling all over this wreath. Check out the site for all the craft details. I love these bats…. they are very realistic looking. I love how they have them gathered all around the front door. This is perfectly scary….. just like Halloween should be. Check out Country Living for all the batty details. Halloween isn’t about scaring people away….. It is about bringing them closer. Sure we like to scare people and creeping them out during this Holiday…. but it is also about welcoming them to your house and offering them either a Trick or a Treat. 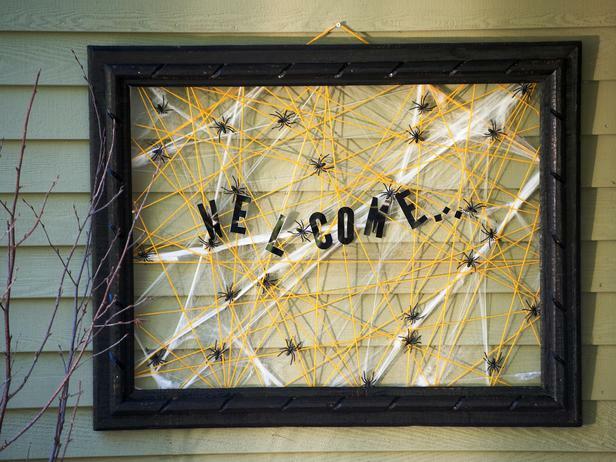 Why not welcome them with this Welcome Door Sign I found over at the DIY Network. 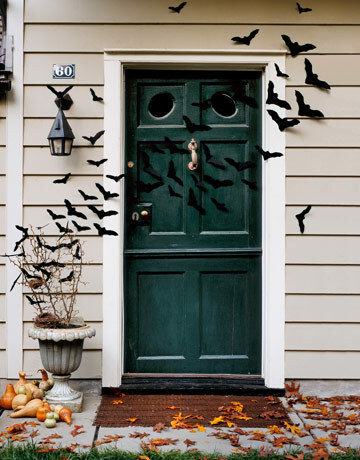 This is a really cool Halloween Door Decorating Craft. It looks like something you could buy at a store, but it’s not. It’s completely hand made and the items that were used for this craft you can pick them up at a Dollar Store… making this craft very cheap to make. Get all the details at La La Bliss. I love this wreath….. it is absolutely beautiful. No one will believe you actually made it yourself…. they will think you bought it. 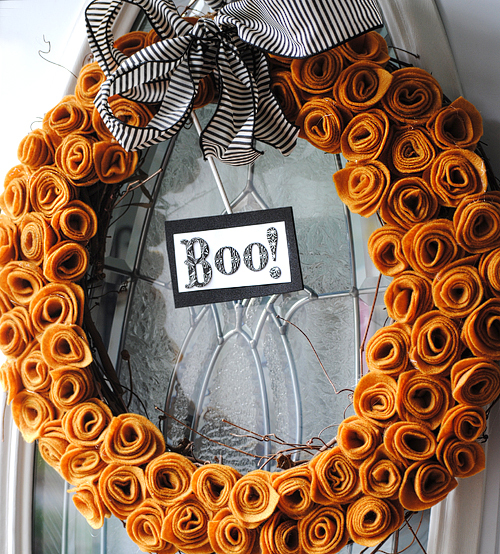 I found this gorgeous Halloween Wreath at Living Locurto…. you need to check it out for yourself. 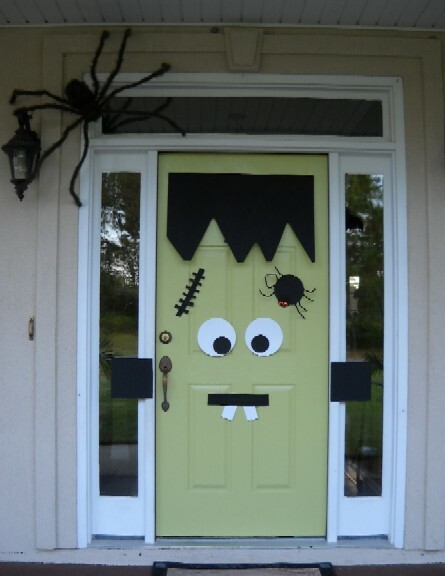 Here is another awesome Halloween Door Decorating Craft…. it is a BOOtiful Burlap Wreath. The black burlap is perfect for Halloween. 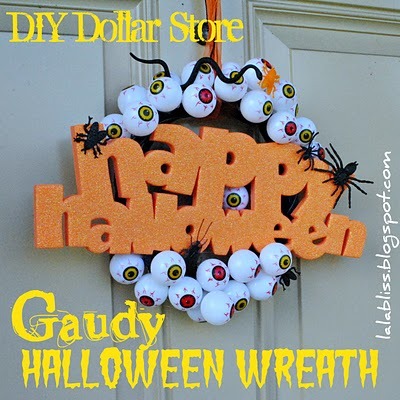 I found this Halloween craft over at Craftaholics Anonymous and I love it. You will be using this Halloween Wreath for years to come. 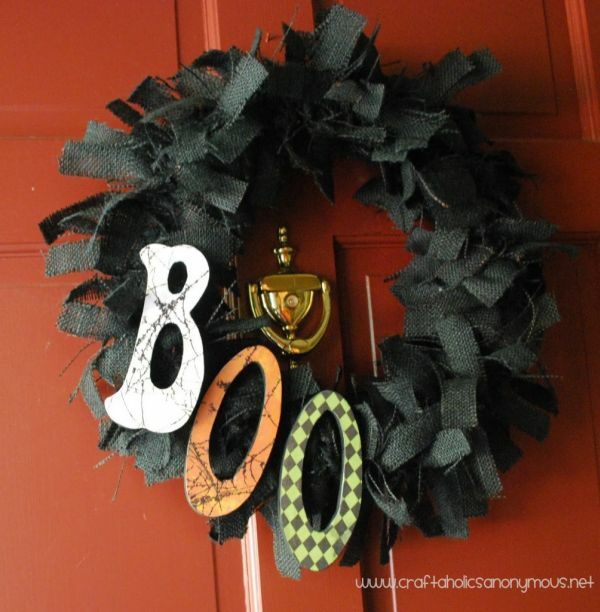 Isn’t this Halloween Wreath cool? It is made from wired ribbon with skulls on it. She cut them into strips and ties them on a wreath. I love the idea…. 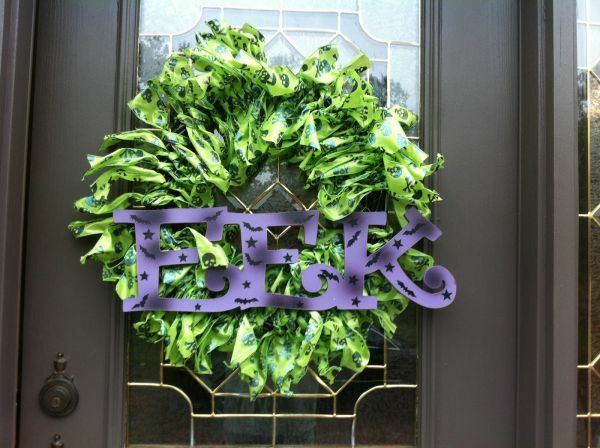 not only fun, but it turned out to be a really awesome wreath. Check out The Evolution of Home for all the crafty details. Ok, this door is just AMAZING!! I found this door decorating idea over at Mel Designs and I love, love, love it!! She took her green colored door and made it into Frankenstein. I know, not everyone’s door is green…. but with just a little bit of imagination any door can be a Halloween Character. I love this Halloween door decoration. I like that it isn’t the usual Halloween Wreath…. 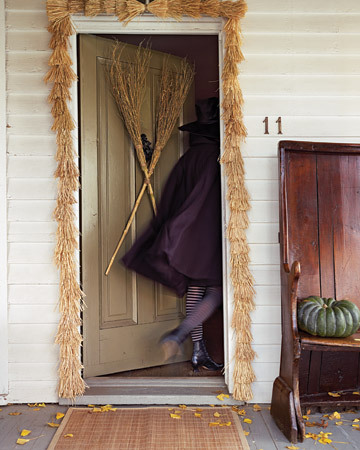 instead Martha Stewart shows us how you can take 2 brooms and wire them together to make an “unwelcoming” door decoration. Great idea!! 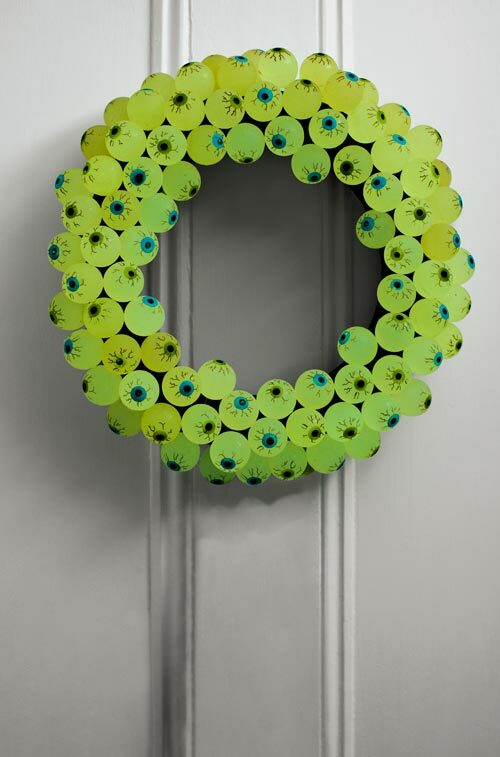 This craft made from glow-in-the-dark eyeballs is a cool Door Decorating Craft…. it is PERFECT for Halloween. Kids will love staring at this eerie Eyeball Wreath. But, more than that…. kids will love making this wreath. You can get all the craft details at at Country Living.